This is a relatively minimalistic tattoo but the meaning is far from that. 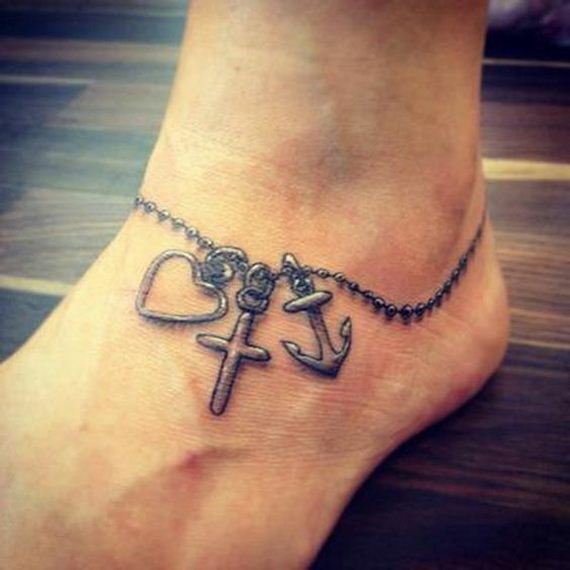 The cross and heart represent faith and love while the anchor holds it all together. It’s a pretty small tattoo too but will allow people to see who you are and what you care about. 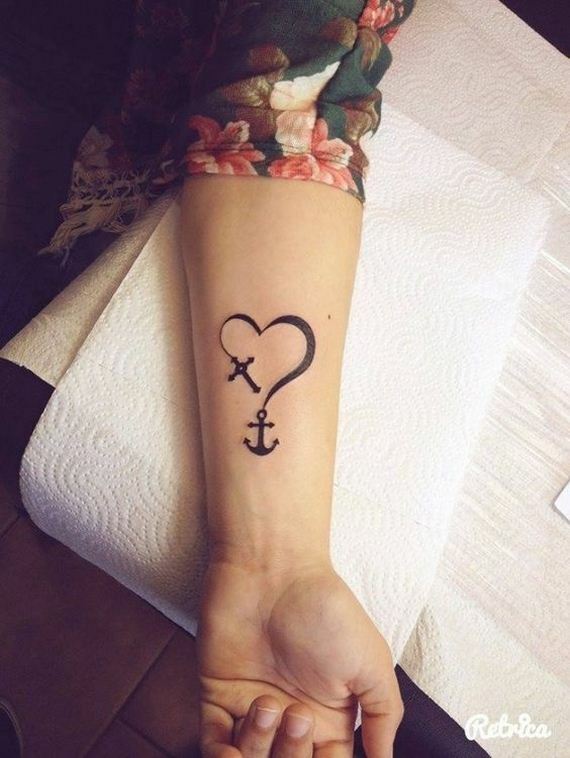 This tattoo takes the extremely simple anchor design and breathes new life into it. Adding the watercolors makes this tattoo look a lot more fun, but doesn’t take away any of the meaning. With the blue at the bottom, it kind of resembles water which is a nice touch. 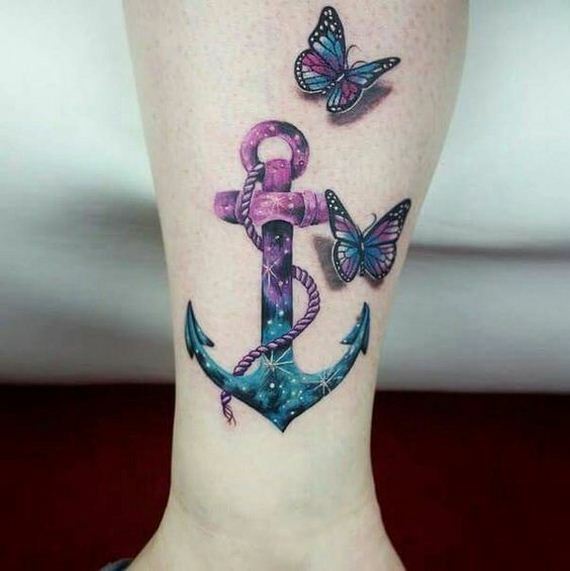 Keeping with the watercolor theme, this anchor tattoo looks a little bit more realistic to a real anchor. The purple, blue and pink in the background almost resemble a sunset while the birds flying away from the anchor can either represent a situation or burden flying away or the bird moving towards something better. Either way, this tattoo can be interpreted in a lot of different ways. 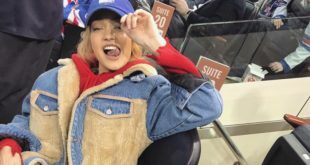 If you’re really in love, then why not showcase that love with a tattoo? 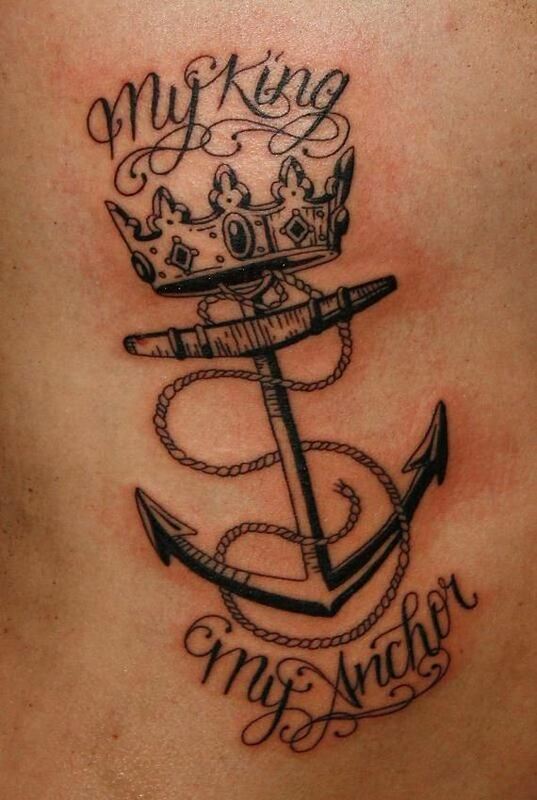 This anchor tattoo features a crown on the top of it with the words “my anchor” and “my king” at the bottom and top. This could be a way to show how much your significant other means to you and how you see them as your own king or queen. Plus this design will show how loyal they are to you and how stable your relationship which isn’t a bad thing at all. Instead of relying on the simple black inked anchor design, this tattoo is a lot more intricate and looks like it’s almost done in henna design. 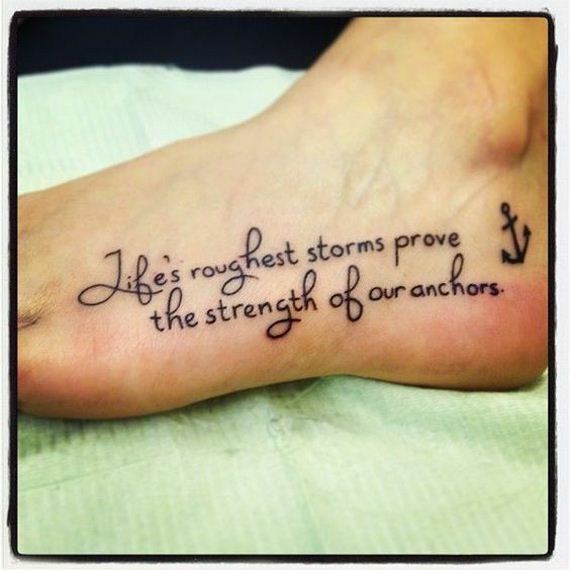 This anchor tattoo is a lot more detailed and is really different from the normal anchor tattoo design. This tattoo is another variation on the original anchor design. 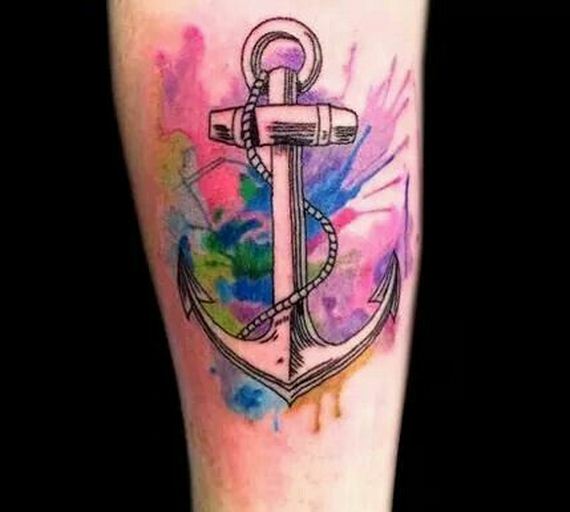 It’s almost like the previous watercolor tattoo but now the blues and purples are actually on the anchor. Along with some sparkles and butterflies, this tattoo is all about looking forward because butterflies represent a rebirth. 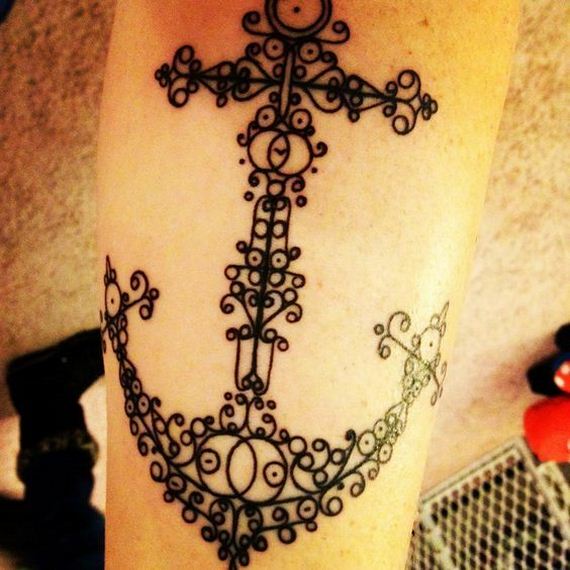 For this tattoo, the anchor isn’t actually the centerpiece but it’s still a prominent aspect of the tattoo. 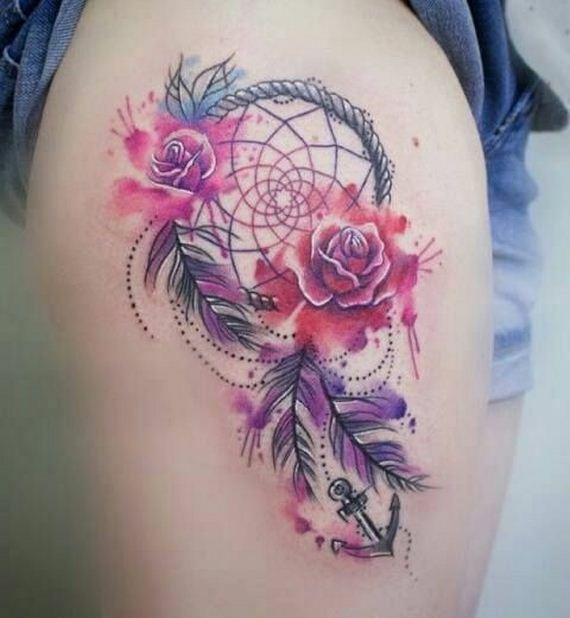 The small anchor at the bottom goes hand and hand with the dreamcatcher but the dreamcatcher is used to ward away bad vibes. 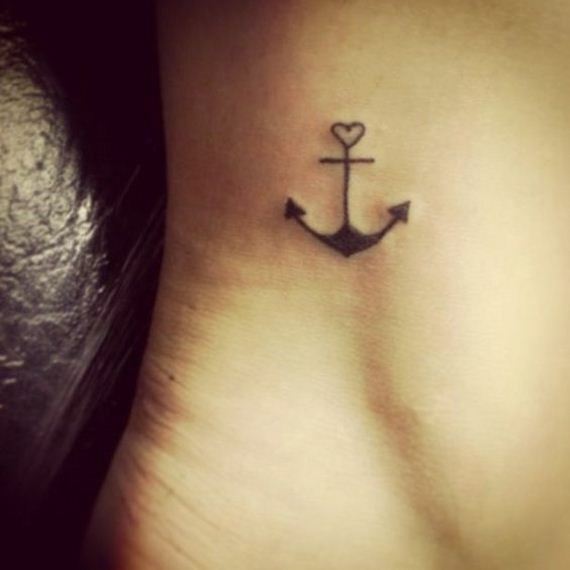 The anchor could also be a symbol for that as it represents stability and hope. 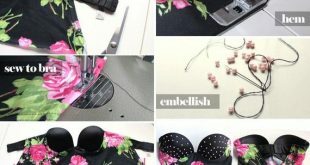 If you have/had breast cancer or know someone who has, this could be a fitting tribute. 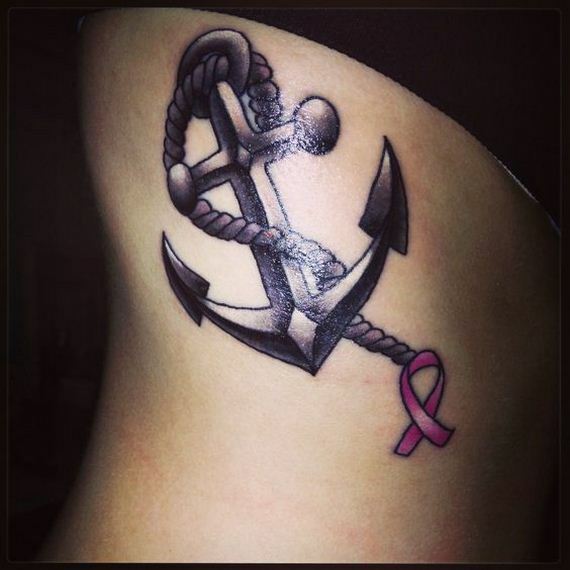 Cancer is a horrible disease but if you or someone you know survives it, an anchor is a perfect symbol for that. 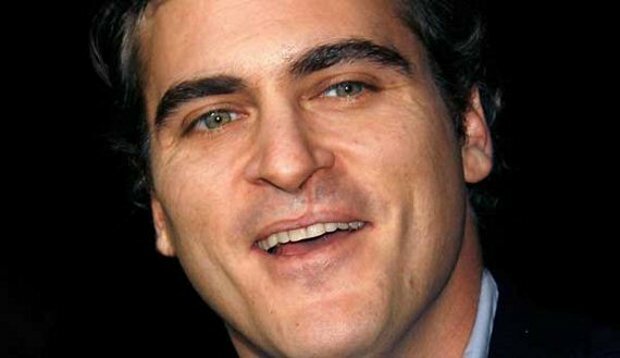 It shows how much hope and resilience you had while dealing with something so horrific. 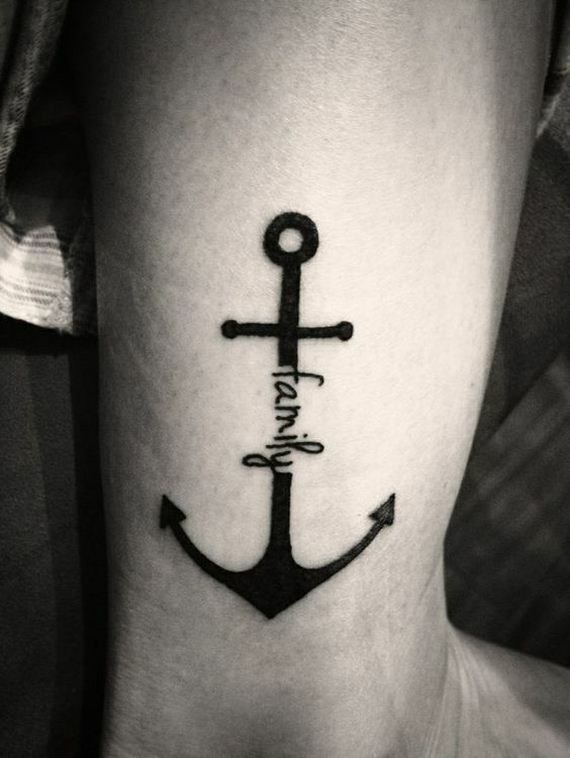 Families normally represent stability and that’s exactly what anchors represent. Combining the two will show how strong of a bond you have with your family and how much they mean to you. 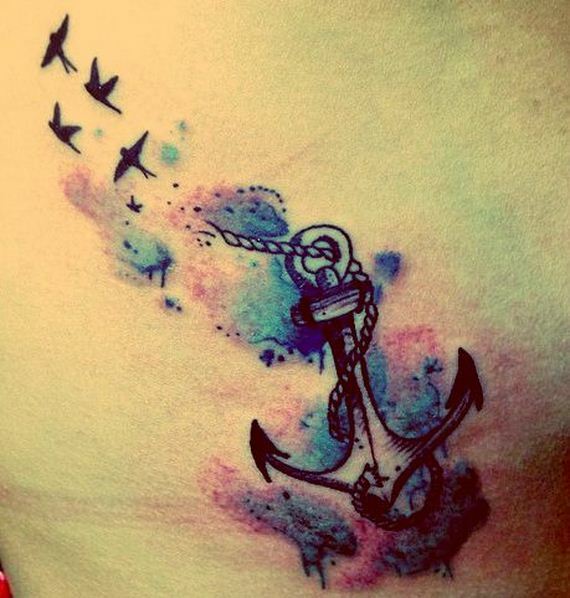 If you weren’t into the watercolor anchor tattoo with the bird, then this simplistic one is a great second choice. 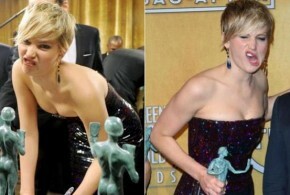 The meaning stays the same but the tattoo just isn’t as flashy if that’s what you want! 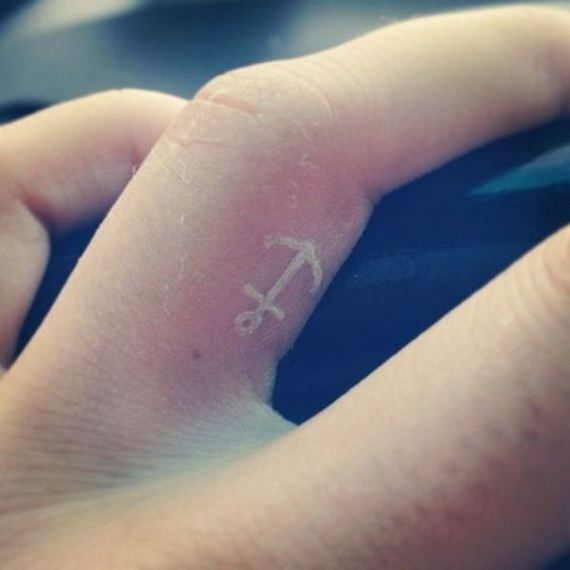 This is just a small anchor but getting it with white ink is completely different. 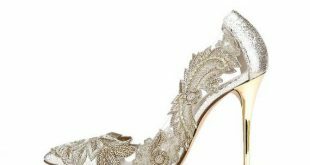 It almost looks invisible on white skin but would look great on any skin type. 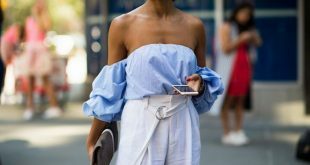 This is just a different variation that not a lot of people would think about getting. This tattoo is perfect if you’re a music lover. 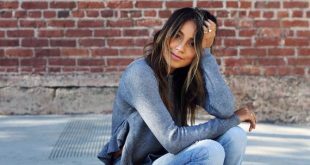 Music might be what keeps you stable or what you’re most loyal to in the world. 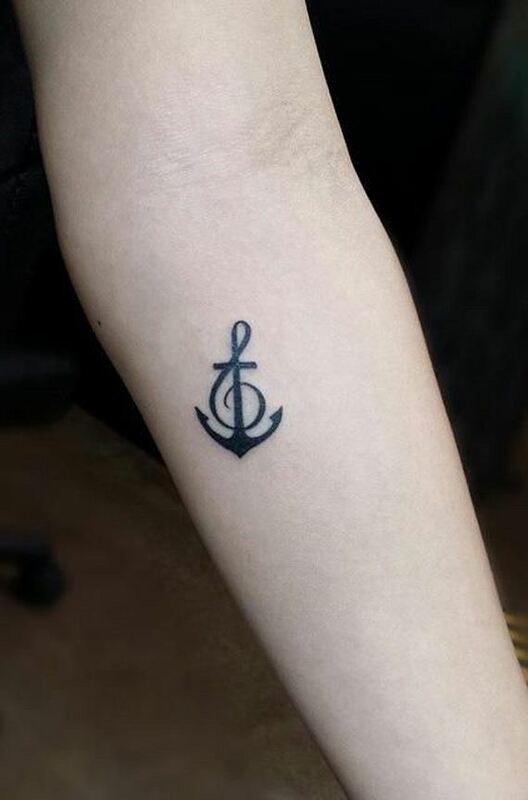 The anchor and the music note are a great way to express that, especially in such a small and simple way. 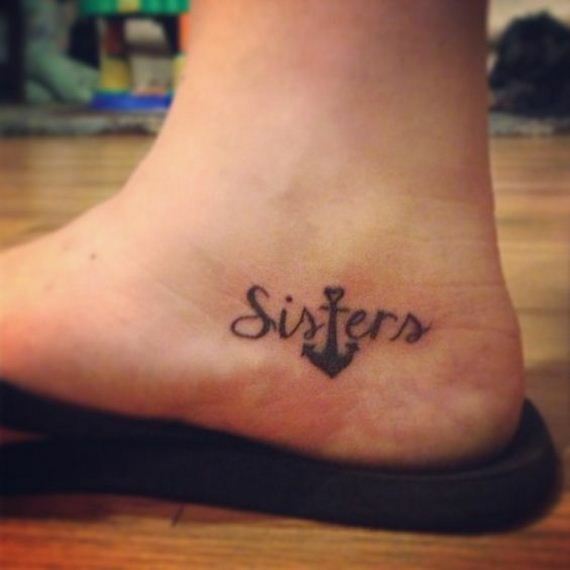 This is a cute idea if you’re looking for a matching tattoo for you and your sister. It’s really cute and small but the meaning is huge. The anchor could represent how you and your sister are literally each other’s anchors or how your bond is stable and unbreakable. This tattoo is one of the most unique on the list, because it uses negative space to actually create the tattoo. 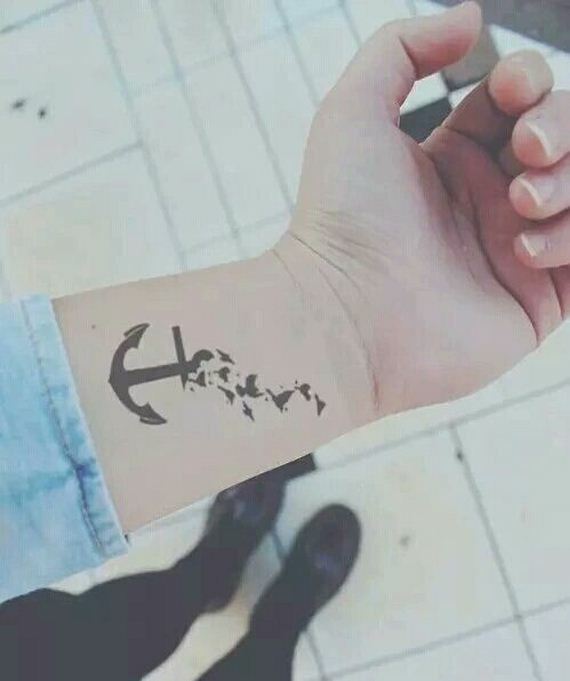 Instead of just having a plain anchor, it uses the background as its canvas and the tattoo ends up looking that much cooler because of it. 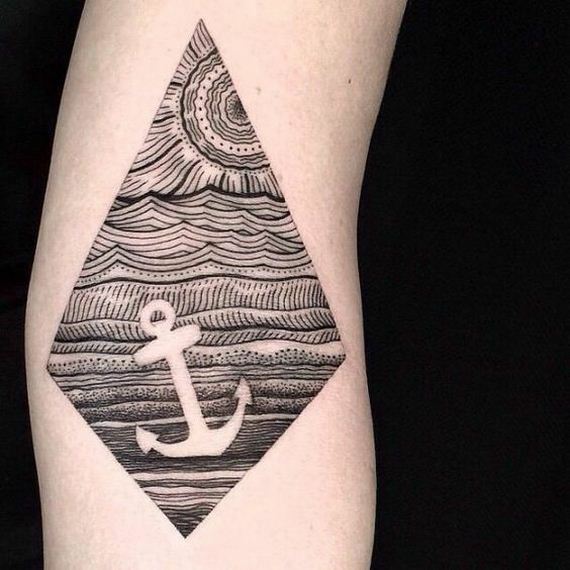 If you really want a unique anchor tattoo, then I highly recommend this one!